This map is inspired by the minigame “Lucky Blocks Challenge” which is played by SSundee and MrCrainer on a weekly basis. Invite a friend (or multiple friends) to participate in the challenge. The setup is pretty simple. All players will get some lucky blocks which they have to destroy in order to obtain items which can be traded for other items you can use for combat in a PvP arena. The first thing you will need to do is to press the button under the sign called “Before You Start”. Next you’ll obtain 30 lucky blocks. If it for some reason doesn’t work then type the following text command in the chat: /give @a spawn_egg 30 12. Spawn the lucky blocks by using the lucky block spawn eggs and then destroy them and pick up all of the items. After all of the lucky block are opened then players need to trade the compatible materials for rabbit feet at the Resource Exchange in one of the corners of the market. Then go to any of the other merchants to buy various combat items, food and so on. There are also two “Effect Tier” areas where you can insert a select number of rabbit feet and in return receive effects that will aid you in combat. After the transactions are complete then it’s time to proceed to the arena selection area. Here you can choose between four different arenas. The creator of this map recommends the Slime Arena! This is a player vs player battle which will end once there is just one person last standing. 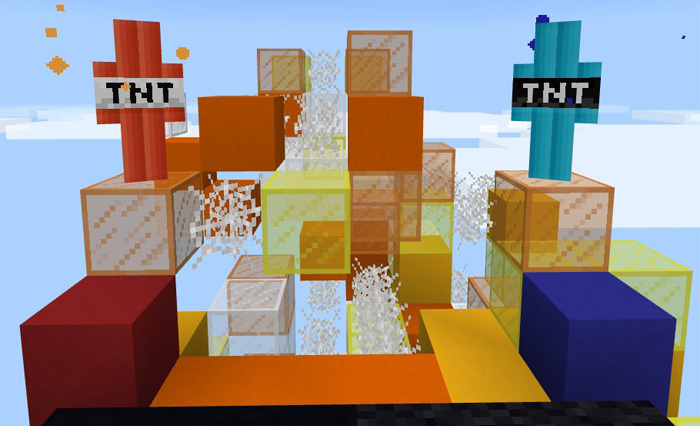 TNT War is a PvP minigame where the main objective is to kill all other players of the opponent team. There are two different teams and each of them have a base on a different island. Between the two islands there is a big wall which you will need to destroy by building TNT cannons and use to destroy it. Even though it takes quite some time to play it’s a really fun and intense game and especially towards the end. This map features two different islands which are separated by a huge wall. Each team’s objective is to shoot through the wall. To make this work they are given all of the necessary blocks and items which are required for building TNT cannons. Once the wall is breached you have to continue firing at the opponent team in order to defeat them and win. There are five different kits and during the kit selection you will put the item in your main hand which represents the kit. It will enchant if it is your turn, and you will get the selected kit. 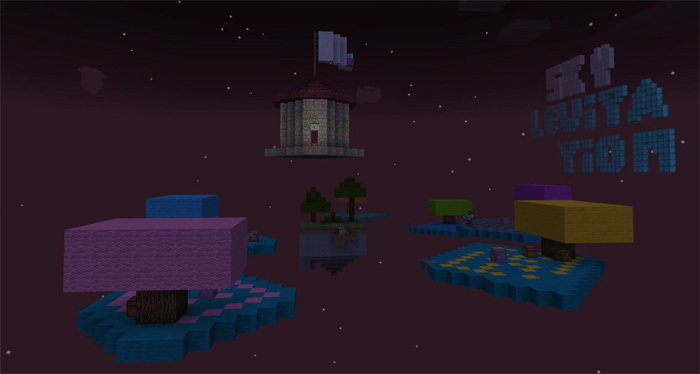 Sky Levitation is a multiplayer map which combines skyblock PvP with levitation. There are a bunch of different islands and on each one you will find a chest with some gear, weapons and food. But that’s not all. You will also find a pressure plate which will give you a temporary levitation effect. Use this effect to access the other islands, loot items and ultimately slay your enemies. You’ll start in a lobby where most of text is in Spanish or Portuguese. Find the sign which says something about English. From there you will be able to access the sky islands arena. Castle Wars is a multiplayer map where you have to build a castle and then defend it against the other team. It’s a really fun mix of gameplay where you’ll start out building a castle and then fight to protect it in a battle. The main objective for both teams are to protect an obsidian block. The team which first loses its obsidian block has lost the game. Make sure to read through the instructions in-game. Since this a PvP multiplayer map it requires at least two players but preferably more. Each team will start out by building a castle. The design of the castle be any way you like as long as it’s built within the assigned borders. Another requirement is that there must be a clear path to an obsidian block placed somewhere at the castle. Press Set into Battlefield once you have completed the build and then press the second button to get back to spawn. At spawn you will be able to use another button to teleport to the Castle Wars arena. The objective is to mine the other team’s obsidian block or defeat all of their team members. If killed during a battle you are not allowed to respawn until the game is over. The Walls is a type of survival game suited for at least four players. There will be four different teams and each one will spawn on a different location. Surrounding each team’s base is a huge wall. For the next 10 minutes players will have to gather resources and craft new items. And all of this needs to happen before the walls fall and the final battle takes place. Each team will be faced with a 10-minute challenge to collect the resources needed for crafting weapons and other items which are useful for PvP. Once the time is up the walls will fall and next a battle with break out. The team that is the last one standing is the winner of the game. This map features a small Gladiator Arena which is best suited for 2-4 players. It’s meant for deathmatch but there aren’t any strict guidelines so feel free to do whatever you seem fit. Before starting each player will be able to choose between three different kits. It’s definitely a nice map to use for training your short range battles techniques. Before entering the actual arena you will be able to select a kit. Each class is a little different but they are still similar enough to make none of them overpowered. You’ll spawn in a cage. You can open the cage gate by pressing the button and then enter the arena. It’s recommended to initiate a countdown before starting off a fight. The last person standing is the winner of the game! Egg Wars is a really fun multiplayer map where the main objective is to protect a sacred egg against the attacking team. But since it does involve PvP (meaning, killing other players) you will need to find other players who are willing to participate. By looking at the size of the map I think somewhere between 2-8 players are suitable for playing this map. As soon as you’ve entered the map you will be able learn more about the instructions and rules of the map. This map can’t be played alone since it involved killing other players. Once all players have joined the world then split up on two teams (red vs blue) and start playing. There are a couple of things worth noticing at your base. 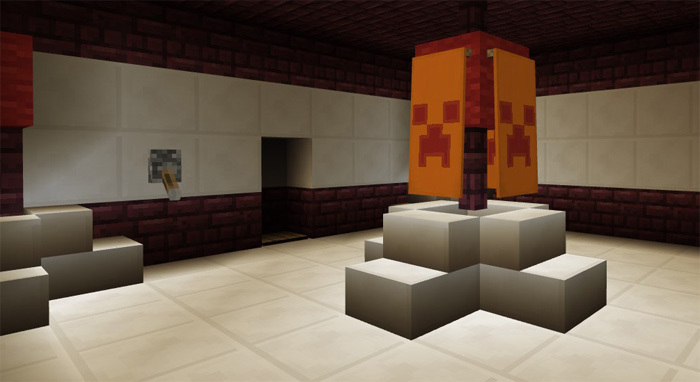 For example, there are “ingot fountains” which will continuously generate iron ingots. The ingots can then be traded for blocks and items at the shop. You will notice that there are also items on sale in exchange for gold ingots. Gold ingots can only be retrieved on the center island. The main objective of the map is to protect your team’s sacred egg. But you can’t just camp and wait it out. Because to win you will need to destroy the other team’s egg. Ultimate Slayer is a quite unrestricted arena with automated processes such as the ability to obtain kits by pressing buttons or stepping on pressure plates to get teleported to a new space. It’s quite barebones at this point but hopefully that will improve as the development of the map continues. As soon as you’ve selected a class and equipped the items then it’s time to enter the arena. There are four different ones to choose from and more will come in a future update. You can check the size of the arena by looking at the item frame for each arena.